On September 20th, Hartnell Foundation will host the fourth annual Women’s Education & Leadership Institute Forum. 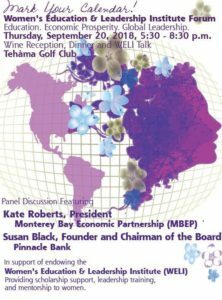 The special night at Tehama Golf Club will feature an intimate dinner and conversation, featuring, Kate Roberts, President of Monterey Bay Economic Partnership, and Susan Black, Founder and recently elected Chairman of the Board of Pinnacle Bank. Join us as a WELI Circle member and receive two tickets to the event and recognition through the event. Learn more by clicking here. You can join our sponsors in supporting the future of this important program. For sponsorship information click here.